Saint Lucia (/ˈluːʃə/ ( listen); French: Sainte-Lucie) is a sovereign island country in the West Indies in the eastern Caribbean Sea on the boundary with the Atlantic Ocean. The island was previously called Iyonola, the name given to the island by the native Amerindians and later, Hewanorra, the name given by the native Caribs. Part of the Lesser Antilles, it is located north/northeast of the island of Saint Vincent, northwest of Barbados and south of Martinique. It covers a land area of 617 km2 (238 square miles) and reported a population of 165,595 in the 2010 census. Its capital is Castries. Christopher Columbus may have sighted the island during his fourth voyage in 1502, since he made landfall on Martinique, yet he does not mention the island in his log. Juan de la Cosa noted the island on his map of 1500, calling it El Falcon, and another island to the south Las Agujas. A Spanish cédula from 1511 mentions the island within the Spanish domain, and a globe in the Vatican made in 1520, shows the island as Sancta Lucia. A 1529 Spanish map shows S. Luzia. 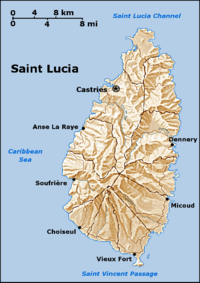 One of the Windward Islands, Saint Lucia was named after Saint Lucy of Syracuse (AD 283 - 304). It is the only country in the world named after a historical woman (Ireland is named after the Celtic goddess of fertility Eire). Legend states French sailors were shipwrecked here on 13 December, the feast day of St. Lucy, thus naming the island in honor of Sainte Lucie. In the late 1550s, the French pirate François le Clerc (known as Jambe de Bois, due to his wooden leg) set up a camp on Pigeon Island, from where he attacked passing Spanish ships. In 1605, an English vessel called the Oliphe Blossome was blown off-course on its way to Guyana, and the 67 colonists started a settlement on Saint Lucia, after initially being welcomed by the Carib chief Anthonie. By 26 September 1605, only 19 survived, after continued attacks by the Carib chief Augraumart, so they fled the island. In 1664, Thomas Warner (son of Sir Thomas Warner, the governor of St Kitts) claimed Saint Lucia for England. He brought 1,000 men to defend it from the French, but after two years, only 89 survived with the rest dying mostly due to disease. In 1666, the French West India Company resumed control of the island, which in 1674 was made an official French crown colony as a dependency of Martinique. In 1722, George I of Great Britain granted both Saint Lucia and Saint Vincent to The 2nd Duke of Montagu. He in turn appointed Nathaniel Uring, a merchant sea captain and adventurer, as deputy-governor. Uring went to the islands with a group of seven ships, and established settlement at Petit Carenage. Unable to get enough support from British warships, he and the new colonists were quickly run off by the French. A short time later the British invaded the island as a part of the recently broken out war with France. On 21 February 1795 and a group of locals under the nominal control of Victor Hugues defeated a battalion of British troops at Vieux Fort and Rabot. In 1796, Castries was burned as part of the conflict. General John Moore retook Fort Charlotte in 1796 with the 27th Inniskilling Fusiliers after two days of bitter fighting. As an honour, the Fusiliers' regimental colour was displayed on the flagstaff of the captured fortress at Morne Fortune for an hour before being replaced by the Union Jack. Moore would then participate in British efforts to repress the slave rebels until falling ill of yellow fever, upon which he returned to Britain before 1798. In 1803, the British regained control of the island. Many of the rebels escaped into the thick rainforest where they evaded capture and established maroon communities. Castries' harbour was protected by a system of 60 surrounding forts. Along the top of Morne Fortune there are six military sites, building work by the French started in 1768, and the British completed the work by 1890. They include Fort Charlotte (Old Morne Fortress), the Apostle's Battery (1888–1890), The Powder Magazine built by the French in the 1750s, Provost's Redoubt (1792) built as a lookout point, and the Combermere barracks. The best preserved installation is a battery at La Toc Point, completed in 1888 it was not abandoned till 1905. This fort in particular was built by the British to repel any attack from the United States on the then valuable coaling harbour of Castries. Much of the scenery for the film Dr. Dolittle was shot here in 1967. Water was shot here, as were parts of Firepower. Dr. Kenny Davis Anthony of the Labour Party was prime minister from 1997 to 2006. In 2006, the UWP, again led by Compton, won control of parliament. In May 2007, after Compton suffered a series of small strokes, Finance and External Affairs Minister Stephenson King became acting prime minister and succeeded Compton as prime minister when the latter died in September 2007. In November 2011, Kenny Anthony was re-elected as prime minister for a third time. In the June 2016 elections the United Worker's Party (UWP) assumed power again, with Allen Chastanet as prime minister. The geology of St. Lucia can be described as composing three main areas. The oldest, 16–18 Ma, volcanic rocks are exposed from Castries northward and consist of eroded basalt and andesite centres. The middle, central highlands, portion of the island consists of dissected andesite centres, 10.4 to 1 Mya, while the lower southwest portion of the island contains recent activity from the Soufriere Volcanic Centre (SVC). This SVC, centered about the Qualibou depression, contains pyroclastic flow deposits, lava flows, domes, block and ash flow deposits, and explosion craters. 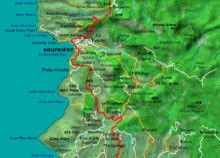 This depression's perimeter includes the town of Soufriere, Mount Tabac, Mt. Gimie, Morne Bonin, and Gros Piton. At 10 kilometres (6.2 mi) in diameter, though the western portion is open towards the Grenada basin, the depression formed as recently as 100 kya. The depression is noted for its geothermal activity, especially at Sulphur Springs and Soufrière Estates, a phreatic eruption in 1776, and recent seismic activity (2000–2001). Eroded andesitic stratovolcanoes to the north east of the depression include Mt. Gimie, Piton St Esprit, and Mt. Grand Magazin, all greater than 1 Ma in age. Andesitic and dacite pyroclastic flows from these volcanoes are found at Morne Tabac dome (532 ka), Morne Bonin dome (273 kya), and Bellevue (264 kya). Avalanche deposits from the formation of the Qualibou depression are found offshore, and in the massive blocks of Rabot, Pleisance, and Coubaril. The dacitic domes of Petit Piton (109 kya) and Gros Piton (71 kya) were then extruded onto the depression floor accompanied by the Anse John (104 kya) and La Pointe (59.8 kya) pyroclastic flows. Later, pyroclastic flows include pumice-rich Belfond and Anse Noir (20 kya). Finally, the dacitic domes of Terre Blanche (15.3 kya) and Belfond (13.6 kya) formed within the depression. Saint Lucia is a Commonwealth realm. Elizabeth II is Queen of Saint Lucia, represented on the island by a governor-general. The prime minister is normally the head of the party commanding the support of the majority of the members of the House of Assembly, which has 17 seats. The other chamber of Parliament, the Senate, has eleven appointed members. Saint Lucia is a two-party parliamentary democracy. Three political parties participated in the 6 June 2016 General Election. Allen Chastanet of the United Workers Party won eleven of the seventeen seats. Saint Lucia became the 152nd member of the United Nations on December 9, 1979. As of January 2018, Cosmos Richardson, who presented his credentials on 22 February 2017, was Saint Lucia's representative to the United Nations. Saint Lucia entered the OAS system on 22 February 1979. At a CARICOM Meeting, the representative of St. Lucia, John Compton signed The Double Taxation Relief (CARICOM) Treaty 1994 on 6 July 1994. The representatives of seven CARICOM countries signed similar agreements at Sherbourne Conference Centre, St. Michael, Barbados. The countries whose representatives signed the treaties in Barbados were Antigua and Barbuda, Belize, Grenada, Jamaica, St. Kitts and Nevis, St. Vincent and the Grenadines, and Trinidad and Tobago. On 30 June 2014, Saint Lucia signed a Model 1 agreement with the United States of America in relation to Foreign Account Tax Compliance Act (FATCA). As of 1 September 2016, the status of the agreement is listed as "in force". Preceding the 2014 FATCA agreement is one which was entered into on 30 January 1987 between the United States of America and Saint Lucia according to Paragraph 2 of the Model 1 agreement, the purpose of which was to exchange tax Information. Saint Lucia has no regular military force. A Special Service Unit and the Coast Guard are both under the command of the Royal Saint Lucia Police. The United Nations categorizes Saint Lucia as a Small Island Developing State, a designation similar to a developing country with a few substantial differences due to Saint Lucia's island nature. The services sector accounted for 82.8% of GDP, followed by industry and agriculture at 14.2% and 2.9%, respectively. Inflation has been relatively low, averaging 5.5 percent between 2006 and 2008. Saint Lucia's currency is the East Caribbean Dollar (EC$), a regional currency shared among members of the Eastern Caribbean Currency Union (ECU). The Eastern Caribbean Central Bank (ECCL) issues the EC$, manages monetary policy, and regulates and supervises commercial banking activities in member countries. In 2003, the government began a comprehensive restructuring of the economy, including elimination of price controls and privatisation of the state banana company. 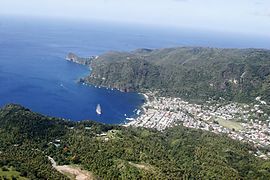 Saint Lucia reported a population of 165,595 in the 2010 national census. In 2016, the United Nations Population Division estimated Saint Lucia's population at 178,015. The country's population is evenly divided between urban and rural areas, with more than a third living in the capital, Castries. Despite a high emigration rate, the population is growing rapidly at about 1.2% per year. Migration from Saint Lucia is primarily to Anglophone countries, with the United Kingdom having almost 10,000 Saint Lucian-born citizens, and over 30,000 of Saint Lucian heritage. The second most popular destination for Saint Lucian émigrés is the United States, where a combined (foreign and national-born Saint Lucians) almost 14,000 reside. Canada is home to a few thousand Saint Lucians. The official language is English. Saint Lucian French Creole (Kwéyòl), which is colloquially referred to as Patois ("Patwa"), is spoken by 95% of the population. This Antillean Creole is used in literature and music, and is gaining official acknowledgement. As it developed during the early period of French colonisation, the creole is derived chiefly from French and West African languages, with some vocabulary from the Island Carib language and other sources.Haiti, The Republic of Dominica, Martinique, Guadeloupe, French Guyana/cayenne, Seychelles and Mauritius speak the same creole with a few words being different. Saint Lucia is a member of La Francophonie. The culture of Saint Lucia has been influenced by African, East Indian, French, and English heritage. One of the secondary languages is Saint Lucian French Creole or Kwéyòl, spoken by almost all of the population. 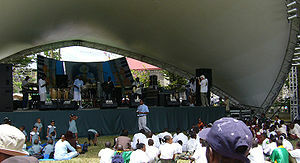 Saint Lucian cultural festivals include La Rose and La Marguerite, the first representing a native Saint Lucian fraternal society known as the Order of the Rose that is fashioned in the mould of Rosicrucianism, and the second representing its traditional rival, the native Saint Lucian equivalent of Freemasonry known as the Order of the Marguerite. References to their origins as versions of pre-existing external secret societies can be seen in a mural painted by Dunstan St Omer, depicting the holy trinity of Osiris, Horus, and Isis. The biggest festival of the year is the Saint Lucia Jazz Festival. Held in early May at multiple venues throughout the island, it draws visitors and musicians from around the world. The grand finale or main stage is held at the Pigeon Island which is located to the North of the Island. 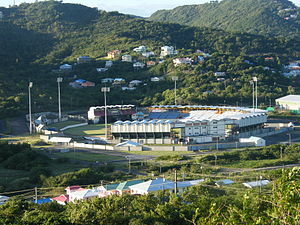 The Windward Islands cricket team includes players from Saint Lucia and plays in the West Indies regional tournament. 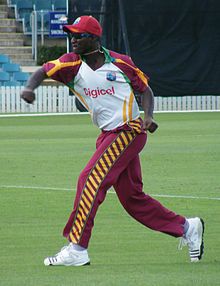 Daren Sammy became the first Saint Lucian to represent the West Indies on his debut in 2007, and since 2010 has captained the side. In an international career spanning 2003 to 2008, and including 41 ODIs and one Test, Nadine George MBE became the first woman to score a Test century for the team. Sammy and George were recognised by the Saint Lucian government as Sportsman of the Year and Sportswoman of the Year respectively for 2004. Dancing in Saint Lucia is inspired by Caribbean culture and enjoys an active following. A popular folk dance is the Kwadril. The Education Act provides for free and compulsory education in Saint Lucia from the ages of 5 to 15. Public spending on education was at 5.8% among the 2002–2005 GDP. Saint Lucia has one university, the University of the West Indies Open Campus, and a few medical schools – American International Medical University, International American University − College of Medicine, Destiny University School of Medicine and Health Sciences, and the oldest of which is Spartan Health Sciences University. The island's cuisine is a unique blend of West African, European (mainly British and French) and East Indian cuisine; this creates dynamic meal dishes such as macaroni pie, Stew chicken, rice and peas, fish broth or fish water, and soups packed full with fresh locally produced vegetables. Typical essential foodstuffs are potatoes, onions, celery, thyme, coconut milk, the very hot scotch bonnet peppers, flour, and cornmeal. All mainstream meat and poultry are eaten in St. Lucia; meat and seafood are normally stewed and browned to create a rich gravy sometimes served over ground provisions or rice. The island is also home to the famous fried dough, known by many as a bake or Johnny Cake. These bakes can be served with different sides, such as saltfish which is either sautéed or lightly fried along with red, green peppers, onions, and seasoned well. This is the most common way for bake to be prepared, though it can also be served with meats such as stewed chicken or beef. Lesbian, gay, bisexual, and transgender (LGBT) people living in Saint Lucia face legal challenges not experienced by non-LGBT members of the population. Saint Lucia prohibits male-on-male sexual activity, punishing those found guilty with 10 years in jail. Saint Lucia was also the only UN member in the Americas to formally oppose the UN declaration on sexual orientation and gender identity. A species of lizard, Anolis luciae, is named for and is endemic to Saint Lucia. ^ a b c "About St. Lucia". Castries, St. Lucia: St. Lucia Tourist Board. Archived from the original on 5 June 2013. The official language spoken in Saint Lucia is English although many Saint Lucians also speak a French dialect, Creole (Kwéyòl). ^ a b c "Saint Lucia". CIA World Factbook. Central Intelligence Agency. Retrieved 13 March 2018. ^ a b c d "St. Lucia". International Monetary Fund. 2016. ^ Hartston, William (21 February 2016). "Top 10 facts about St Lucia". Express.co.uk. Retrieved 13 June 2016. ^ Harmsen, Jolien; Ellis, Guy; Devaux, Robert (2014). A History of St Lucia. Vieux Fort: Lighthouse Road. p. 14. ISBN 9789769534001. ^ a b Harmsen, Jolien; Ellis, Guy; Devaux, Robert (2014). A History of St Luia. Vieux Fort: Lighthouse Road. pp. 16–21. ISBN 9789769534001. ^ This article incorporates text from a publication now in the public domain: Chichester, Henry Manners (1894). "Montagu, John (1688?-1749)". In Lee, Sidney (ed.). Dictionary of National Biography. 38. London: Smith, Elder & Co.
^ Trimble, Copeland (1876). Historical record of the 27th (Inniskilling) Regiment from the period of its institution as a volunteer corps till the present time. William Clowes. p. 49. ^ Cameron, Sarah (2013). St Lucia & Dominica Footprint Focus Guide: Includes Fort-de-France ... (1 ed.). Footprint Travel Guides. p. 32. ISBN 9781909268319. Retrieved 1 November 2017. ^ Cameron, Sarah (2013). St Lucia & Dominica Footprint Focus Guide: Includes Fort-de-France ... p. 33. ^ Brew, Simon (24 September 2014). "Billy Connolly interview: What We Did, Muppets, X-Files". Den of Geek. ^ "Allen Chastanet sworn in new St Lucia PM". Jamaica Observer. 7 June 2016. Retrieved 7 June 2016. 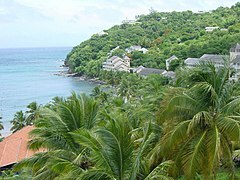 ^ "St Lucia climate". Climates to travel. Retrieved 14 November 2018. ^ a b Lindsay, Jan; Trumbull, Robert; Schmitt, Axel; Stockli, Daniel; Shane, Phil; Howe, Tracy (2013). "Volcanic stratigraphy and geochemistry of the Soufriere Volcanic Centre, Saint Lucia with implications for volcanic hazards". Journal of Volcanology and Geothermal Research. 258: 126–142. doi:10.1016/j.jvolgeores.2013.04.011. ^ "Members of the House of Assembly", Government of St. Lucia, 2008, stlucia.gov.lc (see below: References). ^ Permanent Mission of Saint Lucia to the United Nations. Retrieved January 26, 2018. ^ Saint Lucia Press Release About New UN Ambassador. Retrieved January 26, 2018. ^ "Member State: Saint Lucia". Organization of American States. 2017. Retrieved 18 February 2017. ^ "Foreign Account Tax Compliance Act (FATCA)". www.treasury.gov. Retrieved 18 February 2017. ^ "Agreement between the Government of the United States of America and the Government of Saint Lucia to Improve International Tax Compliance and to Implement FATCA" (PDF). U.S. Department of the Treasury. 19 November 2015. Retrieved 18 February 2017. ^ "Referenced by the Royal Saint Lucia Police". Rslpf.com. 4 November 1961. Retrieved 21 December 2016. ^ "Referenced by Nation Master". Nationmaster.com. Retrieved 21 December 2016. ^ "Small Island Developing States". New York: United Nations Department of Economic and Social Affairs Division for Sustainable Development. Retrieved 13 March 2018. ^ "List of Small Island Developing States". New York: United Nations Department of Economic and Social Affairs Division for Sustainable Development. Retrieved 13 March 2018. ^ "Saint Lucia Economy: Population, GDP, Inflation, Business, Trade, FDI, Corruption". Heritage.org. Archived from the original on 20 February 2011. Retrieved 21 December 2016. ^ "Oecd.org". Archived from the original on 17 June 2009. Retrieved 4 March 2010. ^ a b Bureau of Western Hemisphere Affairs (U.S. Department of State) (12 August 2011). "Background Note: Saint Lucia". United States Department of State. Retrieved 11 November 2011. Languages: English (official); a French patois is common throughout the country. ^ "Welcome to the International Organisation of La Francophonie's official website". Paris: Organisation internationale de la Francophonie. Retrieved 11 November 2011. ^ "St. Lucia Culture". Flights To St Lucia. Retrieved 12 March 2010. ^ "Charles eager to learn from Dessie Haynes". Windies cricket. Archived from the original on 8 February 2013. Retrieved 29 July 2012. ^ "Nadine George awarded MBE". ESPN Cricinfo. 14 November 2005. Retrieved 16 September 2012. ^ "Darren Sammy and Nadine George cop top sports award". Government of Saint Lucia. 21 February 2005. Archived from the original on 20 December 2012. Retrieved 16 September 2012. ^ "Saint Lucia Colleges and University Directory. Universities and Colleges in Higher Education of (Saint Lucia ). Universities, Colleges, Departments, Schools, Institutes of Saint Lucia, version: 2009-11-16,1687412353". University-directory.eu. Retrieved 16 November 2009. ^ Beolens, Bo; Watkins, Michael; Grayson, Michael (2011). The Eponym Dictionary of Reptiles. Baltimore: Johns Hopkins University Press. xiii + 296 pp. ISBN 978-1-4214-0135-5. ("Lucia", p. 162). "Saint Lucia". The World Factbook. Central Intelligence Agency.